.- La Rinconada is an old house of work with 150 years old, the typical Castilian construction, austere and simple. 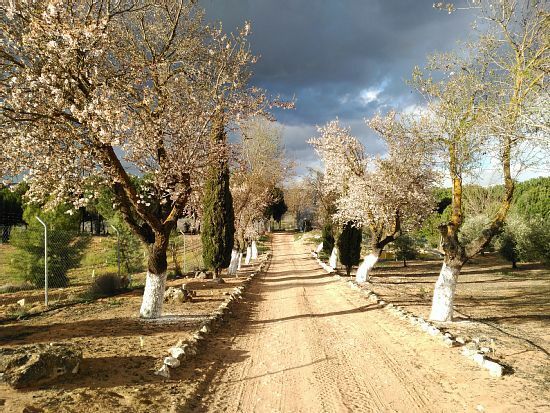 .- It is part of a farm with vineyards, olive groves, pistachios and cereal fields in Villarrubia de los Ojos (Ciudad Real), an hour and a half from Madrid by the highway of Andalusia. .- The house has a lounge, rooms and a large kitchen from La Mancha, similar to a CHOCO, perfectly equipped to prepare all kinds of meals, with fireplace to live the fire and butane kitchen, all with considerable dimensions. Outside you can enjoy the hostel, the garden, the arboretum, the forest, the pool, etc. .- The municipality of Villarrubia de los Ojos is unique due to its diversity, to the north the Montes de Toledo, a perfectly preserved Mediterranean forest and to the south The Tablas de Daimiel National Park, with 1,200 flooded hectares and its salt steppes Priority habitat of the European Union. .- The town has all kinds of services, 24-hour Health Center, Civil Guard, Local Police, workshops, gas stations, Mercadona, Day, Coviran, Parish, 24-hour pharmacies, Bodegas, Manchego cheese factory, restaurants and bars with delicacies such as lamb chops, gizzards, batter, grilled ear, etc. all at a more than reasonable price. In this country house you will find the following: - 100 m² living room with fireplace (with TV). - Complete kitchen (without dishwasher) of 100 m². With chimney - A pack of firewood is provided. Additional firewood pack € 10 - 1 room with 2 single beds on the ground floor. - 2 bathrooms on the ground floor with 2 showers, 2 sinks and 2 wc each. - 3 bedrooms with 2 single beds each on the first floor. - 1 bedroom with a double bed on the first floor - 1 family room with double bed and 2 single beds on the first floor. - 1 bathroom on the first floor with shower, sink and toilet. - Exterior parador of more than 200 m². - Barbecue - 9 x 4 m salt water pool with night lighting. - Rustic grass soccer field. - Finca to walk with area of ​​pines, almonds, pistachios, vineyards, oaks ... etc. - Arboretum, with more than 100 species of native trees and shrubs. - Reforestation of more than 10,000 plants of pines, oaks, rosemary, thyme, almonds ... etc. with more than 20 years. - Rabbit breeding area. - Sheets and bedspreads are provided in summer season and sheets, quilt and duvet cover in winter season. - No bath or pool towels are provided (tenants must bring them). - Although the water is potable, due to its hardness we do not recommend its consumption. Two 5-liter water jugs are always provided. - Solar electric energy, electrical appliances are not allowed. Destacar el trato INMEJORABLE de RAMÓN siempre presente de nosotros por si necesitábamos algo y la excelente ubicación que tiene la casa. Al disponer de dos casas, permite que se realice dos entornos distintas, por un lado tranquilidad ( dormitorios y zona de estar) y por otro lado la cocina , piscina y exteriores. Hemos pasado el fin de semana un grupo de 12 amigos para celebrar un cumpleaños. Una experiencia estupenda. La casa está genial; la cocina campera lo mejor de todo. Al estar separada de la casa principal puedes estar toda la noche sin molestar a nadie, a los que se acuestan temprano o a niños (que no llevamos pero es ideal para ir con ellos). La casa muy sencilla pero bien equipada y limpia, muy, muy limpia, cosa que se agradece. Se duerme de lujo, silencio y buenas camas. Los encargados de la casa muy discretos pero siempre disponibles. Intentaremos volver cuando haga calorcito y esté la piscina abierta, que tiene muy buena pinta. Una sugerencia para Ramón: que le ponga cartelitos a los árboles diciendo qué es cada uno, para que los profanos sepamos qué vemos, porque tiene muchos y muy diferentes a lo que estamos acostumbrados a ver.